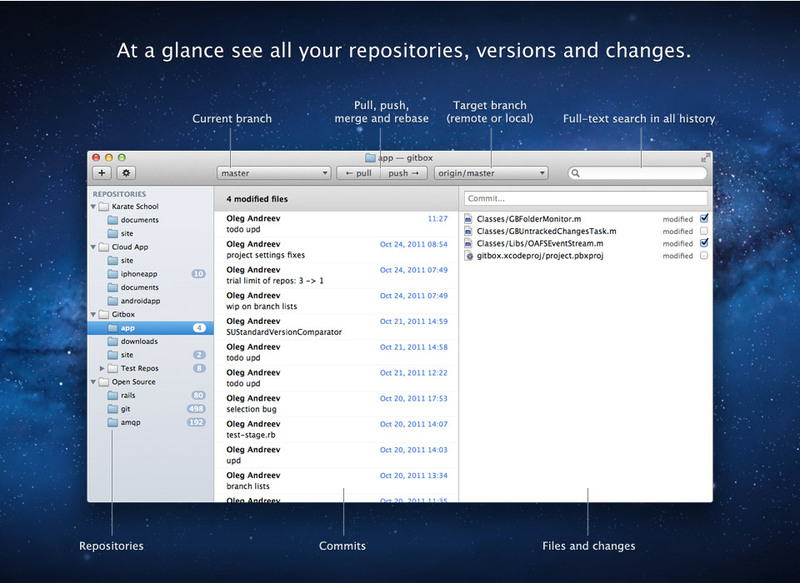 Gitbox is a program for Mac OSX and is not more than a graphical GUI for the free software Git. Git is a versioning tool and is used for keeping track of files and source code if it used by a group of people. It is often used for greater projects. Git is free software and available for I think every operating system you can think of. You can use it on command line and you can do a complete versioning of files with it. It has some advantages and disadvantages. You can find more about that on the internet. Without a graphical system, it can be very hard to be up to date especially at greater projects. Because of this, it is a good choice to use a graphical GUI. There are many different GUIs out there. My favorite is Gitbox. Gitbox has one great advantage over all other graphical Git programs. It is quite simple. For the daily use I need only one Textfield for the commit text and a button to commit. Then there are two buttons for ‘push’ and ‘pull’. All other things like create local and remote repositories, conflict management during merge of two commits or other complex things they are only visible over the menu. So you can say that Gitbox has the same functionality like other graphical programs, the work is easier. Especially for beginners. The user interface hides all complicated things so beginners are not worried about that things. After some work you get a feeling of the program and Git and then you are ready to do complex things. It has a easy to work with interface. It is very good for beginners of Git and the program helps if there are found problems (like merging errors). you can get the program on Mac Store. So you will get updates and support. Sadly this program is not freeware. You have to invest some money. But I can recommend to do that. Especially if you want to invest in a graphical GUI for Git. I can recommend it and NO, I didn’t get money for this article.